Even though I haven’t contacted Cosmo or updated pics of my Grandchild. I feel that they have made no effort on their part either. More or less they got the money and I get nothing and was guaranteed nothing also. So I understand your feelings on this and agree. Thanks this was really helpful to me. I did have a appointment to meet with Cosmo next month. I don’t think I will be keeping that appointment. Malinda, thanks for your perspective, however, I seriously doubt you are the rule and are the exception. The thing you have to understand is that Cosmo made expectations that they could never fulfill, that’s a form of fraud. If my perspective leads someone to not use Cosmo or your perspective leads them to use Cosmo that’s their own choice. This article is my way of letting people know what could happen to them because it happened to me. I am so sorry to hear that you had a bad experience with Cosmo. It is so unfortunate when two people can’t see each others perspective and create a win win for all. I was a model with Cosmo for six years (1989-1995) and I made a lot of money. Grant it, my first year I don’t think I got one call (I was 19 years old). I think the first year you are in the book the clients think you have no experience (and you most likely don’t) so why do they want a newbie working for them when there are others to choose from who have some experience. Then the second year the phone started to ring (I guess now they thought I had some experience, I didn’t). Anyway, the jobs were bad and the pay was worse. I think I stood in Kroger passing out crackers for hours on end. But I took those crappy jobs to gain experience and to let Cosmo know I was serious. Over the next several months the jobs got better and by the next year I was invited to be in the top section of the book. Then I did great!!! I do however think a lot of it has to do with what the clients want. There are a lot of jobs for a young female adult (once you are 21 you can do liquor ads) who has the typical model look. I worked with very few children, older adults or ethnic people. That was not the choice of Cosmo but of the client hiring the talent for a specific job. The client wants to portray their product or service in a certain way. The young blonde model type fits the bill most of the time. I think I was chosen because of my DNA and my level of professionalism. I do understand their attraction to home school children. It is more convenient. The vast majority of interviews I went on gave me a day or two warning (if not an hour or two) and they were all during business / school hours. I was a freelancer at the time and could go at a moments notice. I’m sorry you never got a job, who knows the fairy one might have been fun, or not. Modeling was a great experience for me it taught me how to walk into any situation and handle it with confidence. Even if I never got one job the classes and photo shoots helped give me a level of poise and composure that I had not learned anywhere before. I truly believe that something good always comes out of something ‘bad’. Look for your silver lining to this event in your life and you may just find yourself smiling upon the whole thing. Valerie, before you decide, look around the web for other responses to Cosmo as well as their BBB reputation. I toned down my article but there was other stuff about Cosmo that bothered me. I may add it back in. I to just had a meeting with Tammy, She was quick to ask for the money. Saying I’ll take a credit card over the phone. I was approached in a mall. Yes, I feel that I’ve got the look to do this but, something about this just doesn’t feel right. There is no guarantee and they know how to play the game. That’s Tammy’s job, she approaches people at events and she usually has one of their working models with her. My opinion is that Cosmo could not survive without new recruits, meaning they don’t make enough to run their business based on the work their models get. And they are competing with other local agencies. Tammy will also give you the impression that they need more (in your case) boys. For me it was men. You also have to consider the fact that you’re counting on them to get you work, remember that paperwork that was less than impressive? That feeling is the right one. Even if you do use an outside photographer they will charge you a lot of money for classes that seem OK but aren’t that great and then there’s the modeling portfolio. They have ways to make money off of you. Did she mention that most of the stuff to do with modeling is not tax deductible? A truly reputable agency doesn’t need your money up front because they would know how much they could make off of you. I’m within my legal right to give you my opinion and my opinion is to stay away. You will have buyers remorse and you will kick yourself for being so easily duped. You came to the internet looking for information because of a feeling you had, your feeling was correct, it’s too good to be true. The only people that are going to make any money is Cosmo. We were approached by Tammy at a downtown festival in Lou. Tammy was interested in my one son in particular who is 11. What I would like to know is did Tammy let you know that you have the option to use a photographer outside of Cosmo? Their fees for this ran from 1300 if paid in lump sum to 1600 if payments need to be made. And yes the paperwork they gave me was less than professional. thanks for having this article up, im trying to model and was considering cosmo. i hadnt met or talked with anyone but want to check stuff out. the website was very unimpressive as you said. i dont think cosmos getting a call from me! I have had a great experience with Cosmo. Just in the month Sept. I have done two jobs. One with critter crusade which lead into another job and then a two page spread with Today’s woman magazine. I have been in tons of shows/tv appearances/pieces for the Derby. Modeling and Cosmo has really added to my life and allowed me to go to the Bahamas, Paris, and Mexico. As well as by a 2001 Sypder convertible, pay my way to UK, and I am only 18. With any job you get out of it what you put in. There is not a single model from me to Tyra Banks that didn’t have to pay money, take class, or work had themselves to get where they want to be. There are plenty of people that have been helped from Cosmo whether it is financially or with their self confidence. I’d recommend taking them to court. Thanks for the comment Sarah, hopefully this article and these comments will save other people from the scam that is Cosmo. Funny, but my daughter and I went to see them recently and I feel like I have to add my two cents here. My daughter’s had several jobs (commercials, modeling, videos, etc) in the past, so she’s not “green” to the industry. We went to Cosmo because she’s looking for something she could do while attending a local college. One of the first things they asked us for was to pay this crazy cost for photos ($1300+). Since my daughter already had professional photos, we showed those to her and she dismissed them as “fake backgrounds” and they couldn’t use them for that reason. Funny, but the photographer took the pictures OUTSIDE at a local park and used existing props! Nothing fake there, honey. The other jobs she’s had only took ONE photo for her to get hired (the other agency we used needed only one — and didn’t care where we got it!). Why would I want to spend money on yet MORE photos? When you look up SCAM in the BBB’s website, I think Cosmo created the script. The “interview” was all about paying for pictures with THEIR photographer and us having to listen to this woman brag about what she did in her past youth. Gee. Norma, best of luck. I’m glad you found my article useful. None of my information was fabricated, the only thing I had to gain by publishing this article was to educate other people. I hope it works out for you and you daughter. Come back here and post your experiences if you go with another agency. Well,well..The internet does have some information I truley need for a change. I have set up an appointment with Tammy for my daughter tomarrow..I know any lagitmate agency doesn’t have to charge a fee.Unfortionately my daughter will be disappointed about the whole thing. Still I am just going to find the real thing else where.. I am not dragging her into a fake set up.. Thank you for your info..
Alix Adams Model School & Agency, Inc. This is there fees for children; $196 up front or $22 weekly with 20 deposit. For an 8 week course once a week. Adult courses are $345 up front or $32 weekly with $25 deposit. For a 10 week course. Well, Cosmo called me up. They said that they were recruiting children to be in the Derby. So, they also said that they would like to take some more shots of my daughter. When I called them up they she said ” Oh I think your son would do great in the Derby..” “My Daughter” I replied.. Then she said yes “of course. We at Cosmo love your daughter’s look and think she would great. So bring her back for some more head shots”. What a crock of crap. I bet the camera didn’t even have film..they showed the pictures.. I love my daughter but the pictures just came out horrible!.. ..That ignorant woman had the nerve to tell me how great they looked. How much money she would make..”First job maybe about $3000.00 to start.”.. Hmmm.. Then she gave me a piece of paper of the price list of their photography fees. ..$485.00 then $875.00 and it would have ended up to cost around $2000.00..
Oh yeah and they can’t take it of the first job because there will never be one..right…I gave her the piece of paper back and told her thank you very much..then we left..Not once did they mention the reason why they called me. Which was to recruit for the Derby..Cosmo..is just a high tech name for ” Sucker every second..” I know Maybe I didn’t fall for it but I bet Some other parents did. .Since they did call about the same time most were getting their Tax refunds. I also noticed that these were economically challenge families..they were taking this money from. That must be the reason why they went to the local Mall in our small town. Because they don’t have the Jerk-O-Meter like city folk do. They still kept calling me afterwards..until they finally gave up after over 20 phone calls to my voice mail. I would still recommend sending your child to link http://www.alixadamsagency.com you will be much happier and less broke in the end.. Good luck to all the families..
Christina, I believe you and your Mom have made the right decision to not go with Cosmo, most legitimate modeling agencies make money from your work, not you. The photos from Cosmo, as I remember them, were not very good. I am actually currently trying to become a model at Cosmo. I had an appointment with Tammy a few weeks ago and since then she has called me just about every week to check if I am still interested and if I am able to come up with the money needed for the photo shoot on June 27. I have seriously been considering paying the money she asked of. 1300 in full, 625 with monthly payments, or 475 with monthly payments. Tammy has already faxed me the paper work needed and the next step would be to give her my bank account number. Now because I am going to be a senior next year I’m also stuck with trying to find a studio for my senior pictures. However, Tammy assured me I would be able to use the pictures from the photo shoot that would be “New York quality” for my senior pictures instead. Although, once I have repeatedly viewed the models on the website, I was very unimpressed with the quality of the photos. I expected amazing pictures from a modeling company, but I was willing to still pay for the undesired pictures as long as I would be represented and possibly be called for a job. I would like to say thanks to these comments, I have made my decision not to follow through with Cosmo. My mother and I have been going back and forth as to whether or not this was a good idea. Mostly because I was conviced this was my best option seeing as how all I have heard since I had my interview is how they are a “legitimate bussiness that has been successful in representing models for over 35 years.” At least that is all I have heard from Tammy. I’m thankful for the stories shared. Although, I do hope this decision doesn’t leave me with regrets. As I was surfing the web looking where I can post my “experience” with Cosmo, I came across your article! I really am sorry as to what happened to you. I just want to say that your daughter is adorable! Here’s my situation – I have done a good amount of research for toddler modeling & acting careers and I have concluded that the 2 best places to start are Wilhelmina agency (which by the way DOES NOT ask you to pay for anything – which is the right way to start in this industry), and http://www.commercialkids.com. However, I posted my information on Cosmo website that I would like to see how they work. Next day, I received a call from Nancy ( I thought it was a guy (boy! she must smoke 5 packs a day!) that she would looooooove to meet my daugher. Wow, I was extremely surprised, considering she hasn’t even seen her yet. I’m sorry but I have to say this is really comical to me. Sooo okay I didn’t call her back right away because I was swamped with life!…she left probably around 5 voicemails altogether before I had the time to call her back. DO NOT PAY ANY MODELING AGENCY MONEY UNTIL THEY GET YOU THE JOB! bottom line. Rebel, I seriously didn’t expect to be talking about Cosmo this long after my experience. However, I’m very glad people have been able to use my experience for their own benefit. Thanks for sharing your story, together we are saving families from wasting their time and money. Wow, I’m actually going to be attending the University of Louisville this fall and I needed to find an agency to represent me and I thought Cosmo was the place for me. Before I graduated I did a Beauty Pageant and I’m guessing because I excelled in it, they immediatley wanted to represent me. However I wanted to wait until I moved there but THANK YOU ALL very much for this information because I now will NOT BE GIVING COSMO MODEL AND TALENT AGENCY ANY OF MY BUSINESS AND NEITHER WILL MY FRIENDS OR FAMILY. Renea, I’m glad you found this article and our comments useful. Best of luck to you. Thank you Rob Jones !!!! you are an Angel & saved us alot of money for our 2 kid’s.we were seriously thinking about paying $1,400 for teen & $500.00 for toddler.but me & my hubbies gut were having a bad feeling. if our kids are so promising & perfect ? then why do you need all this money? i agree with all complaints posted here….on the building,copies of paper work,ask for payment on 1st visit,the same line over & over,the smell,rooms (no air moving @ all ),location,cards with ur pic. on it & the less than 5 minute head shots for both kids…….wasn’t really working with toddler @ all. but the staff was nice & 2 young girls @ front desk were cute & nice….but really couldn’t guarantee anything for us with all this money they need & no work yet???? I am very disappointed & hafta break this bad news to my teen today after we researched the web. & saw 22 complaints filed on them to the BBB. Rob,we are very sorry of your expensive loss with nothing in return..well actually Wisdom for us all,,I do pray the God will intervein in this situation & you do get refunded or company has to be held accountable for the fee’s innocent hard working families have paid out already or getting their hopes up high & shame on them for dissappointing our kids!!! Rob Jones you are so funny. I have been laughing the whole time while reading ALL of the info that you have wrote on here. It’s sooo funny. I feel that I have the right to laugh because I experienced some of the same things that you did with cosmo. I never recieved any paid jobs, however, I did go to two or three auditions for volunteer jobs. Was chosen to do a derby fashion show and t.v. appearance, but they were volunteer as well. I was promised by Nancy that I would do well. She told me that she not to worry and that she would take care of me. She expressed that I would get jobs. I still have two months left on my contract with them. No jobs yet. Two years ago, I was approached by Kippee at a Home and Garden show telling me how beautiful my daughter was. I was told to come in for an interview. My daughter was 3 at the time, my son was 6. I had both children with me at the interview and she told me that the agency could represent both of my kids for the price of one, $1300. I said no at first. It was too much money. I left, but received several phone calls from Kippee asking me to reconsider. She was positive that my kids would be working soon. I was told this was a new program that the agency was doing to promote more children for less cost, but because they currently didn’t have a lot of children represented, we would be getting in on the bottom level and mine would be working soon. My children were excited about modeling, especially my daughter. She is quite out-going and loves dressing up and being girly. She loves to get her picture taken and I really thought it would be good for both of my children to have the confidence of being in front of a camera and other people. I did research what I could online, but I hadn’t found anything negative so I I signed up. We had a photo shoot but I wasn’t impressed with the photographer at all. He barely spoke to my childdren. He would simply snap some pictures and tell them to move a little and then snap some more. Although my children thought it was fun, I was disappointed. I think more could have been done. When we got our comp. cards, I was a bit concerned as their pictures were not centered and their personalities didn’t show through at all. I really thought I could have done a better job taking pictures on my point and shoot. However, it has been a year and a half and no jobs. Kippee has called once this past spring to ask if I would like to bring in my children for an interview and then to set up a photo shoot as they were beginning to do shoots for the summer. When I informed her that my children already had a photo shoot, she acts shocked and surprised. She even said that she didn’t know they were already representing them. I was told she would check out their pictures and get back with me so we could talk about some upcoming projects. Needless to say, she never called back. I have chalked this up to a very expensive learning experience. It is sad that my children have asked about when they will get to model, and I have to tell them probably never. Their pictures are on Cosmo’s web, but not one call. I understand clients pick their models, but I was led to believe we were going to have great opportunities. Also, I was told that the agency would be working hard to promote my children as they wouldn’t be generating income without their models working. I think they really generate their income from suckers like me for outrageous photo shoots. (I didn’t even receive copies of their pictures.) Now, there are lots of children on their web page, and I wonder how many of those have actually worked at all. It is interesting that the magazine ads that they show on their website that they have done have not changed in a year and a half. Live and learn that is for sure. I am SO thankful I “stumbled” across this site! My daughter and I were about to go in a pay the $1300, but now . . . I don’t THINK so!!! Ok i live in IN… I went to a festival there its a really small festival called heritage weekend!! I went and there was a booth set up for cosmo there. I went in and looked around! The lady cynthes asked if i was interested i said yes i was everyone has told me i should be a model since i was young. Well I was wondering if i should go to the apointment i have this week because im afaid its a big scam. the lady told me i was very pretty and i asked well how much money would it cost she said no up front fees and you should never have to pay for classes either you got it or you dont. But then she said i will have to pay for the picures that they have to send out for companies to see (which i guess is a portfolio). well that confuses me because whn im suppose to go in there this week there suppose to give me a free photo test well why cant they just use those photos! Im complety broke anyways and trying to get an apartment so i would have to borrow money from my boyfriend! I really want to be a model but im so confused there are some good comments but there are also bad comments. I was hopeing i would only be out like 300 dollars and i would be able to pay it back first job, but now im so confused and im young so i know nothing but what i read. So any advice on what i should do should i go in this week or not im kinda leaning towards i really should forget about being a model!!!!! Andrea, you shouldn’t just take any one person’s advice about Cosmo, however, there is a consistent theme in all these comments and if you were to put it together it would tell you to not use Cosmo. Maybe you should re-read the article and all of the comments. When you’re finished you really shouldn’t be confused about what to do. on right side of page on web site. click on consumers & type buisness in & it will pull up their rating & complaints.. Cosmo had 22 complaints on file & all reported no jobs after $1,300 was paid. please use your money for your apartment & education for your future first. persue modeling as a hobbie for noe untill you get your college degree. if you go & read all the comments posted here..some give you other names of agency don’t charge fee’s. I don’t want to shatter anyone’s dreams…but i did research on model agency…they will pay fee’s & pictures cuz they see spmething & willing to take risk. please take a motherly advise out of concern. you can still pursue modeling but with alot of research first on the agency tho….ok? …. well then do you now of any other better modeling agencys around the louisville area that would be any better!! ive wanted to be a model since i was like 10 years old!! I am SO glad to read all of these posts. We were also pulled into a Cosmo booth at a local festival, Jeffersontown Gaslight Festival. We were told how lovely our Asian daughter was, (which she IS!) and how she should apply to be a model and have a free photo shoot. Got the same song and dance that everyone else has shared and were very disappointed over the price of about $1,400. Same observations about the building as everyone else. Cynthia was very nice and I don’t know how she is able to work for those people. Bottom line, we can’t be ripped off since we simply don’t have the money, period! I hated to have to tell my daughter, but we will see what other agencies are out there and if there are any who don’t charge a huge fee, we will consider it. I don’t have a problem with some expense and the Alix Adam classes might be a good thing for her to go through just for self-esteem. If an agency is genuinely representing you and getting you valuable work, they deserve to gain by it, but the Cosmo situation is definately a rip-off and a shame. A number of years ago, I was enrolled at Cosmo; my parents were thrilled that I was getting involved in something, anything, for that matter. Then came the up-front fees for contracts, courses, and their poor excuse of a photographer. Yet, I was still involved in everything: the classes, the changing in the bathrooms, etc. Overall: no work. You are telling the truth, Nancy; you won’t approach “just anyone”… only those that appear to have the proper bank account. A few years ago, I modeled successfully in a major market in a large city. I don’t think things have changed that much. There will always be modeling agencies/schools that are willing to take advantage of wanna-bes – it’s a lucrative source of income. However, if you truly have potential, NO money is exchanged upfront with a reputable agency. Yes, you do need pictures. But when I signed with mine I was responsible for my own headshots and was given a list of the best fashion photographers in town. I spoke with other models within the agency whose comp cards I admired (all on display at the office) then interviewed and chose who I wanted to use. There is a great deal of good information and advice on the web from top agency reps from the best agencies. Google Neil Hamill with Elite (my former boss) I believe he gave an interview once about how agencies work, what they look for etc. Good luck and good sense everyone. Rob I agree totally with you post, I now model for Cosmo and I have been for about1.5 years now. I have had no jobs only two interview/audition but no jobs. When I first met with Craig I was happy about modeling cause it was something I really wanted to do. I guess, well I know now that all that happiness I had left me blind of what was happening. I didnt look for any complaints on them or BBB. I too am seriously thinking about filing my own complaint in hopes of getting my money refunded. Here are some facts and opinions and also hopes this helps people save money by not signing with cosmo. Rob I wish I would have read this before it would have saved me alot of money, but Thanks this still helps me now. I signed Craig told me I would do great and I have the perfect look, and that wehn I come to do the photo shoot we would pic out what WE thought were best. I didnt get to choose anything when I went in for another meeting he showed me the pics “he thought were best”. I didnt get to pic my own clothes some lady picked them out of my clothing. I got two auditions while making payments i paid them off and never heard from them again. Model_Guy, thanks for adding to the long list of comments. This is what makes the internet awesome. Some people have come here after they donated money to Cosmo but many people who found this page early used their donation for something better. There is no doubt based on the comments that Cosmo has not received money that they may have otherwise received due to the honesty of the comments on this page. I’m glad to be able to continue to help people make an educated decision. We met Nancy at the Mall Sunday evening and she pushed us to bring our son in for a free photoshoot. Of course we think he’s cute, but I’m not sure he’s model cute, so I was skeptical. My husband thinks he has “it”, and maybe he does because he loves the camera and knows how to work it. But that’s neither here nor there… We were encouraged to bring our son in the next evening for the free photo shoot. They now have up-to-date computer technology, Rob! But the stairs are still a bit hard to find and the steep stairs and narrow hallways are disconcerting. Yet not stinky! Sign in, fill out a brief questionaire, the expected stuff. Then we waited while Nancy loudly (she only has one volume) berated somebody on the phone in her office behind is. She later complained about know-nothings like tthat person who call her like they know the business and she doesn’t. Not very professional of her. A nice lady took us to another room and took some images of our son, then we returned to the waiting room while she loaded them into a computer. They were played on a large screen with lots of positive comment, but I was thinking, “Bet you say that to all the boys!” And then we went into her office. We were shown books of print media featuring Cosmo models. Not many details were forthcoming, like how one actually gets jobs or if there’s an audition process, or how much notice one has. Just lots of glossy images. Then the sales job. “There’s a photo shoot next Sunday”.. It had to be then, that’s when they start the spring season. Ok, plausible enough. Bring 3 outfits, be there at 9.. my husband jumped in “Is there a fee?” Oh yes. She whips out a brochure and a piece of paper. $800, or that can be broken down into easy $100 a month payments, but for you we can spread it into $50 a month payments. Is that affordable? We debated over a year on which couch to buy, yeah, I’m going to make an $800 decision just like that! My husband gamely kept up the act, but I’m afraid to say I shut down – Danger! Something smells funny! Ok, all you sucessful Cosmo models and fans, I’m not saying they NEVER find work for anybody. It’s just I went home Sunday night and did my homework. According to industry experts like the president of Wilhelmina (modeling agency) in New York, you never pay upfront. They get the initial photo shoot money back when you get work, not before. Otherwise what’s their motivation? They spent a couple of hours taking some digital images and uploading them to their website and made $800! If you get work, BONUS, if not, they have money and you never get work. Who’s the loser? The split Nancy mentined was 25% for them, which is higher than the industry average or 10%-20%. Even the Better Business Bureau says a genuine modeling agency doesn’t take fees up front, but then maybe Cosmo doesn’t know that because they are no longer a BBB member. 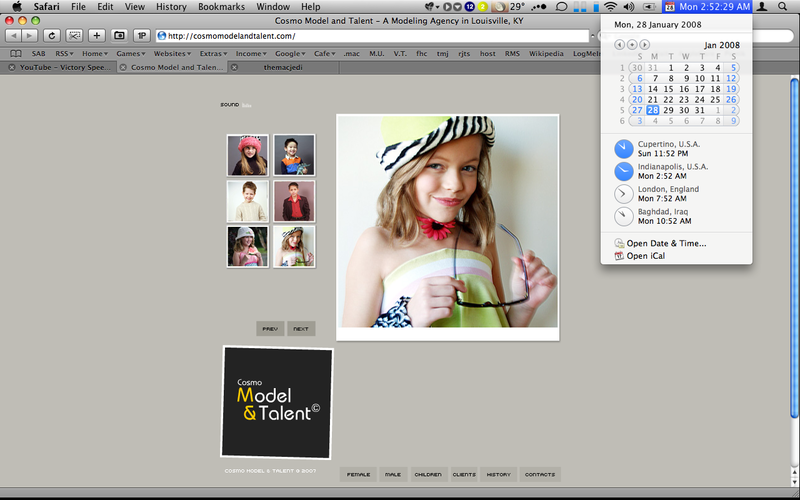 While there is no licencing for model agencies in my state, it’s not legal to charge fees up front. I guess these are $800 photos. The hair and makeup were supposedly free. We left quicky, being told we had to call her by 9 am the next morning with our decision. A rush job is never a positive. We were not given a contract to look over, but maybe we would have gotten one if we actually went to the (cattle call) photo shoot. Ha ha ha ha!!! She said my place of employment used Cosmo models, but I asked around today (I’ve been here a decade) and it hasn’t been in at least the last 15 years. Proceede at your own risk. You may get work, you may not, but they WILL get hundreds from you up front. That’s the only Cosmo guarantee. So, I’m 15 and I went to the mall like two days ago, and a lady named Cynthia came up to me and said,” hey, you’re really tall and skinny, have you ever thought about being a model.” And, well, I haven’t so I told her no and walked away. She called for me again saying that I would get paid $150 an hour after I “auditioned.” She was very sweet to me, saying I looked way older, and that I had such a cute style. It really got my hopes up. She made me sign up.. Which was my name, phone number, city I lived in, and basic informaton like that. It looked pretty legit to me. So, I went on the website and saw a girl who goes to my school on there modeling for Sam Meyers in the St. Matthews Mall. Now that made it seem even better. She said that there is a free photo test and everything, and getting paid and everything really makes me want to do it. I’ve been watching America’s Next Top model and I’ve always had that thought that maybe I could do it, but do you think I should go in and talk to them at all? Or just completely go somewhere else? I’m only 15, of course, so I don’t have a job, and I do not want my parents to pay a whole lot for me to model, which is something I would only like to do as a teen. Any advice? Curious Teen, the best advice I can give you is to trust your instincts. If you think anyplace is out to get your money or your parents money it’s quite possible that’s exactly what they are doing. Read all the comments above, they will help you make a sound decision. As many people have said a legit modeling agency doesn’t ask for money upfront because they make their money from getting you work not selling you classes or photos. You need to do way more research. I know sometimes it’s difficult to pass up what we think are opportunities but if I’m not shopping for a new computer and someone offers me one at a great price I always decline because that’s just the kind of setup that causes buyers remorse. I am so glad I read this! I just went to an appointment with cosmo yesterday and I was considering starting, but after all of this, I will not be wasting my money. Thank you!!!!! Wow. I don’t feel as though I can add anythingto any of the above posts. When in for a test shot today, but Tammy tried to convince me that my wife and I would fare better. I’m not photogenic at all and I know it, I could smell the bs a mile away. Paying that much money up front sounded crazy. She looked at me cockeyed when I told her I was unemployed. (looking for that fast buck) stay far away from these scam artists! Jessica & Joshua, I’m glad you found something useful in this post. Thanks for your comments. So I got asked by cosmo to come in for a test shoot and I have already been scammed before by a different agency so I know how it all goes. But, I told the current Cosmo model that when I was scammed by another agency, they made me pay for classes and I never heard from them again. She then proceeded to tell me that they don’t have classes. She also told me everything would be free. I’m a little confused now. After this article I can definitely sense the scam but after what the model told me it all doesn’t make sense. By the way, that girl did not look like a model. Her teeth were brown and rotting out. Steph, is your comment a joke and you’re just fooling around or did that really happen? I’m trying to make sure the info on this post and comments are legit. Pamela, Your Welcome, Your Welcome, Your Welcome. Thank you Rob Jones! Went in to Cosmo for my daughter only. Nancy wanted to sign both me and my daughter. My husband was so excited he wanted to pay immediately. I wanted to do a little research first. Very thankful I came across your website! She wanted $1575 for me and $500 for my daughter. I was told they only take pictures every 5-6 months. “I was very luck I came in when I did! They were having a photo shoot in two weeks. They only accept 3 kids. There was one spot left for my daughter. And, they only take 8 people over 18. There were 2 spots left. I should get my pictures now even though I am 4 1/2 months pregnant because they will not have another photo shoot for 5-6 months and I will miss out on the busy season. I better decide soon! The spots will be taken soon!” Thank you! I have NEVER posted anything before but, I was compelled to say something this time. You’re welcome Lisa, what did decide to do? There lots of ways to get your kids started in the entertainment industry, Cosmo is not one of them. If your kids are interested you should find them a good theater program. Floyd Central High School is good if you live in Indiana, look up Stage One & Center Stage if you’re in Louisville. I wish you all the best & I’m glad you found value in my article. She didn’t exactly, and my daughter is not fat, but she’s average. Anyway, she gave us a card, please come see me at my booth over there. I did a few gigs locally (Indy/Chicago) when I was 19 and 20 so I immediately told my daughter that it was a scam. That yes, she is beautiful and yes she might even get a job or two, but that the photos would be a fortune and that any reputable modeling agency is not going to have a kiosk in a shopping mall where they try to recruit people. You have to go to the modeling agency in most cases and they are not going to charge you a fortune for photographs. It is extremely rare to get discovered in a mall or somewhere like that and definitely not when you are 5’5″ and in Louisville, KY. Anyway, I stumbled on this site and just wanted to add my two cents and life experience to hopefully save others from getting scammed. If you really want to model, find an agency that pays you and doesn’t take your money. Yes, you may need to pay for photos for a portfolio, but you can get them for far less than Cosmo charges and most reputable agencies might recommend a photographer but they will not INSIST you use their photographer. My daughter is interested in modeling and so we are pursuing it by lining up some fashion shows at shopping malls and I am also talking to a childhood friend who hires models for his fashion catalog (small one). This is a way for her to see if she enjoys modeling and get some experience. I suspect she’ll be like me and decide she really doesn’t like it that much and isn’t ever going to be a supermodel and will get bored with it after a while. I’m a 17 year old girl, so of course when I talked to my mom about modeling and she got me and interview with Cosmo, I was over the moon. My mother had sent my selfies and pictures from formal events and they jumped on the opportunity to have me come in. We went in the next day for what was supposed to be a 45 minute to an hour interview. We walked around trying to find these hidden stairs and finally made our way down the cramped hall to a very dreary office. I filled out my basic information and sat down to talk to Craig Dalton. Craig was very nice and super talkative. He discussed his career with Cosmo in great detail and went on to say how he thinks it’s a great industry for young adults. He discussed how he just called a college student about a job that would pay $800/hr so I thought, “Man, that would be sweet.” Of course, my mom and I fell for it. Every poisoned word that came out made us fall even more. We paid for the pictures up front. $1,300 went right out of my mother’s bank account that day, only to be returned by me working as much as possible at my retail job. Craig said I had the look, but it didn’t show in any of the pictures. The pictures I have are horrid. I know it sounds dumb but I take better selfies than that! I expressed my frustration to my mother, she obviously wasn’t that happy about the situation either. I contacted Craig from multiple emails and have yet to get a response on how to get myself out there to potientially be offered a job. Out of 3 emails, I have not received a response back. They prey on parents who truly believe their child has what it takes and the children who think they can do it. They are just in it for the money which is super upsetting. At first I told them I was getting cold feet and they said they wouldn’t be able to return any money, even though I hadn’t taken pictures yet. I wasted my time taking off from my job and my mother’s hard earned money. Whatever you do, please do not go to Cosmo for a modeling career. They crush your dreams and take your money. If anyone knows of modeling agencies that are not like Cosmo, I’d really would love to know. I signed with Cosmo about a month ago and I assure you there is an upfront cost. At least 650$. All together they charge about a grand and a half for the 200 initial shots. I also am working with Nancy and though she seems very straight forward there is just something that seems off. Did Nancy say “I guarantee that you will have all kinds of work” ? Apparently Ms. Greenwell doesn’t know the dictionary definition of the word ‘guarantee’! Nancy Greenwell personally guaranteed that I would have “…all kinds of work.” and that I was ‘guaranteed’ to have a return of my investment. Ms. Greenwell will not return my calls. I have asked her about fulfilling her guarantee and refunding my money. She simply likes to play with word games and semantics. It’s unfortunate that many people only find this article after they have invested in CM&T. I’m happy for those that my article has helped before investing or those who stopped investing after reading all the comments & opinions. Nancy Greenwell won’t even return my calls. I saw her at Mall St Matthews a little over a month ago. When I asked her if she had plans to fulfill her ‘guarantee’, she simply ducked the question and proceeded to chase some teenage boy. Follow up. Last week, I sent Ms. Nancy Greenwell a friendly text message that she has not fulfilled her ‘guarantee’. I even sent her the dictionary definition of the word ‘guarantee’. Ms. Greenwell replied that she is ill and retired from Cosmo. I’m calling BS. I don’t know if she is ill or not because I believe absolutely nothing that ever came out that awful woman’s mouth. I have been having all kinds of fun with the name of Nancy Greenwell on social media and she can’t touch me. Every thing I’ve ever posted about Ms. Greenwell is the truth and if she tries to do anything to me for speaking the truth about her she knows that she will have to face a charge of theft by deception. I hope that she sees this! Im so glad ive read this. Thanks Rob and everyone else that left they comments and experiences..Sorry for those that had to go through it, but hope it teaches us all going forward some of the things to consider when looking forward to working with these agencies..